One gallery in Seeing Nature is dedicated to Jan Brueghel the Younger’s The Five Senses series. Painted in 1625, this series is a close copy of five paintings by Brueghel’s father, Jan Brueghel the Elder (who painted the backgrounds) and Peter Paul Rubens (who painted the figures) in 1617–18, now in the Museo del Prado in Madrid. Each painting focuses on one of the five senses, providing a platform for visitors to consider their own encounters with nature. Today we focus on Hearing. In Hearing (as well as in Sight) dedicated to the senses associated with lofty intellectual pursuits, Jan Brueghel the Younger elevates the settings to reveal pleasing vistas with archducal residences. Each vista yields a view of a royal home, adding political and dynastic associations to these complex but harmonious renderings of earthly experience and accomplishment. 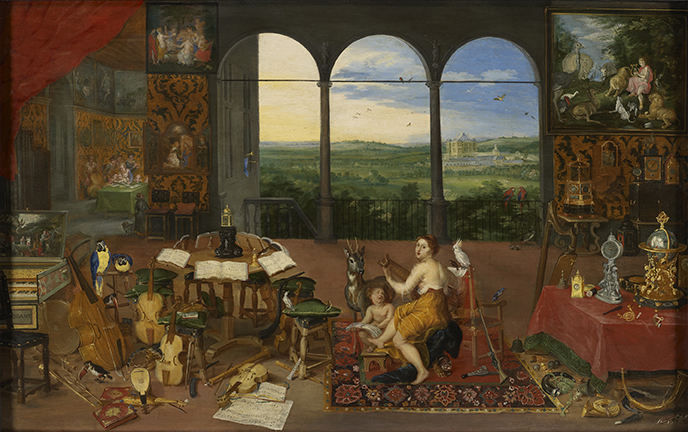 Here, Venus sings and plays the lute, surrounded by natural and man-made noisemakers, including exotic parrots, hunting horns, and musical instruments. This entry was posted in Exhibitions and tagged 5 senses, Jan Brueghel the Elder, Jan Brueghel the Younger, Paul Allen, Seeing Nature, senses. Bookmark the permalink.